The words "dead cat" will likely inspire amusement in all but the most devout aelurophiles, but in The Lieutenant of Inishmore, the untimely demise of two felines launches a chain of events that will end in their bereaved owners enacting terrible vengeance on the murderers of innocent creatures. More difficult than the quantities of simulated gore, gunfire and furry corpses mandated by Martin McDonagh's scathing satire of Irish partisanship, though, is the eleventh-hour entrance of the hitherto deceased pet—alive, unharmed and blissfully unaware of the bloodshed initiated on his behalf. Cats being notoriously untrainable animals (the venerable Samantha's Acrocats notwithstanding), most theaters confronted with the climactic final scene involving men shouting and waving guns in the bewhiskered face of "Wee Thomas" as they debate executing their captive—often amid strong protest by playgoers—conceal the relevant action behind furniture or resort to puppets and sound-effects. The ambitious AstonRep Theatre Company, however, boasts a ten-year-old Tom—listed in the playbill as "Widget"—among its cast members. Unlike many animal performers, Widget has no formal wrangler or backstage quarters—not even a carrier or leash. After a thorough inspection of the auditorium during rehearsals to familiarize himself with his environment, Widget now arrives at the theater approximately halfway into the show and sits comfortably backstage with the other actors until his cue, when he is handed off to Scott Olson and carried onstage. "We put out a call notice for a black cat who could tolerate loud noises and people running around, and we got a response from Ashley Riot, his owner." 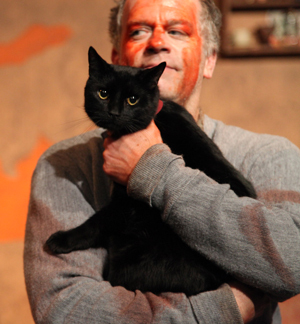 says AstonRep artistic director Robert Tobin, "Widget's never been on stage before, but he's a real pro—he's curious, like all cats, but really good with people and always mellow, whatever the situation." Olson concurs with this assessment, "Sometimes he gets a little thrown at the top of the scene, coming out suddenly into the lights and the big space, but if you hold him, he soon feels secure and calms down." The scene also requires Wee Thomas to tuck into a bowl of cold cereal as his caretakers marvel "See? He does like Frosties!" Although McDonagh's script wisely provides an alternative line in case its star isn't hungry that night, so far Widget has devoured the designated contents—in reality, a portion of his favorite cat food—with unhesitating aplomb, despite the preceding excitement. A number of audience members have been observed lingering after the show to admire the charming bit-player. Tobin is not surprised. "He's a beautiful cat. No one's requested autographs or photo-ops yet, but I'm sure that's coming at some point in the future."